Testing, Inspection & Certification (TIC) Services Market size is estimated to be over USD 240 billion by 2024; according to a new research report by Global Market Insights, Inc. The testing, inspection & certification services market is propelled by the growing trend of outsourcing services from third-party specialist firms. Large corporations & state-owned establishments are gradually outsourcing their TIC activities to reduce the cost and focus on their core business competency. The stringent government regulations to ensure the safety and quality of the products also drives the market growth. Over the past five years, the incidences of non-compliance scandals have increased significantly. This is encouraging government authorities to implement stringent regulations associated with testing, inspection, and certification standards. Moreover, the rise in the unethical manufacturing methodologies to reduce the cost is also augmenting the demand for the TIC services market. The quality expectations and consumer safety requirements are becoming complex day by day, and the nonfulfillment of consumer expectations has led to product callbacks. This is forcing companies to employ advanced inspection methodologies to comply with the industry standards and fulfill customer expectations. The certification service market is anticipated to attain CAGR of over 9% during the forecast timeline. The increasing concern towards the product quality, safety, and environmental health is driving the market growth. Furthermore, the requirement to comply with the national and international standards is augmenting the demand for the testing, inspection & certification services market. 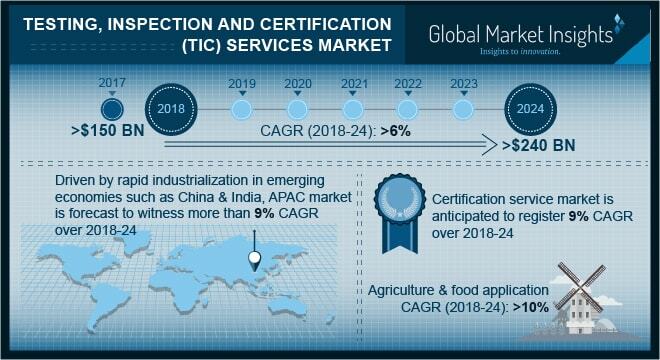 Agriculture & food markets are among the most lucrative applications of the TIC services market. These are anticipated to grow at the CAGR of over 10%. The increasing focus of the government authorities on the food safety and health is a primary factor driving the market growth. Food contamination diseases are forcing the governments to develop strict standards and guideline for manufacturers to ensure the safety of their products. Furthermore, the increasing number of foodborne illnesses are driving the demand for inspection services in the food and agricultural sector. For instance, in 2016 the FDA reported a Hepatitis outbreak due to contaminated frozen strawberries, which caused 143 illnesses across 9 states and hospitalized approximately 50 people. In addition, the increasing trade between countries and the globalized food supply chain is also driving the demand for TIC services within the food and agricultural sector. The key players in the testing, inspection & certification services market are Applus, Apave, Bureau Veritas, Corelab, DEKRA, Eurofins, Intertek, DNV GL, Lloyd’s Register Group, TUV SUD, SGS SA, SYNLAB, TUV Rheinland, TUV Nord, ALS, SOCOTEC, Kiwa Group, RINA, and UL. Merger & acquisition is the common strategy used by market players to gain the market share. For instance, in November 2017, SGS acquired BioVision Seed Research Limited to strengthen its presence in the Canadian Agriculture market.